A retirement plan for your business can help you attract and retain quality employees, provide large tax deductions for your business, and help you save outside of your business. But there are a lot of options when choosing a retirement plan and choosing the wrong option could put stress on your company’s cash flow, create unnecessary administrative burden to the business, or limit the amount of money your employees are able to save. There are three primary options to choose from when selecting your business retirement plan: a 401(k), SEP IRA, or SIMPLE IRA. How do these retirement plans compare? · Employers contribute via matching employee contributions and profit sharing. · Employees contribute through salary deferrals. · Maximum Annual Contribution Limit of $55,000 per year, with a maximum employee contribution of $18,500. Business contributions are capped at 25% of the employee’s income. There are also catch-up contributions available for those over age 50, which allow for an additional $6,000 in annual contributions by the employee, and total annual contributions of $61,000. There are also options available for employees to take loans and hardship withdrawals from the account. · Higher maximum contribution limits for employees compared to other plans. · Employees are eligible to contribute. · Roth options are available. However, the benefits of a 401(k) also come with some added disadvantages. 401(k) plans require annual testing to ensure that the plan does not benefit highly-compensated employees more than regular employees and will also require added annual tax forms to be sent to the IRS. Also, 401(k) loans may lead to additional administrative burden. · Only employers contribute; employees are not eligible to contribute to their SEP.
· Maximum Annual Contribution Limit of $55,000 per year, with a maximum contribution of 25% of the employee’s salary. There are no catch-up contributions are available for those over age 50. No option for employees to take loans from their retirement accounts and the business must contribute to all employees. · Flexible contribution amounts: employer is not locked into contributing or matching contributions each year and amount can vary each year. · Employees are unable to contribute. · No catch-up contributions for older employees. SEPs are beneficial for industries that are cyclical in nature. Whereas 401(k)s and SIMPLE plans require employer matching contributions, which could potentially put a strain on the company’s cash flow in lean periods, a SEP allows for flexible contributions from the business. All employer contributions are based on a percentage of employee income and the contribution must be equal for all qualified employees. SEPs are also a great tool for those with multiple sources of income. If you participate in an employer sponsored retirement plan, you may be eligible for SEP IRA savings if you have additional income from another entity. A doctor who works at the university can contribute to their university’s 403(b) plan, while also contributing to a SEP IRA with income from additional consulting work. When would a business benefit from a SEP compared to a 401(k)? We look at a few examples later in this article. · Employer contributes by either a 2% or 3% match of employee salaries. · Employees contribute via salary deferrals. The Maximum Annual Contribution Limit is $12,500 plus employer matching contributions. $3,000 in catch up contributions are available for employees over age 50. · Simple to administer, as the name implies as there are only two contribution options to choose from. · No IRS tax filing are required. · Catch up contributions are available for workers age 50 or older. · Lower maximum contribution amount compared to other plans - $12,500 max + company match. SIMPLE IRAs provide a ‘middle of the road’ option for many businesses. Employees are able to contribute to their retirement in addition to the business matching contributions. But because of the lower contribution limits and maximum 3% company match, required contributions by the business are smaller and less likely to create a burden on the company’s finances. We will look at a few examples comparing a SIMPLE account with a 401(k) and SEP further below. What retirement plan is right for your business? At Midwestern Financial Group, we will help look at your specific situation to find the best plan for you, your business, and your employees. Example: The Difference in Contribution Options for a SIMPLE IRA. A business has two choices for contributions if they elect to have a SIMPLE IRA retirement plan. They may choose to make a 3% matching contribution to employees who contribute to the plan or a 2% contribution to all employees regardless if they contribute to the plan themselves or not. For example, company XYZ, Inc. has 2 employees, John and Sarah, each who are paid $50,000 per year. John contributes 4% of his salary to his SIMPLE IRA and Sarah contributes 0%. If the company elects the option to have a 3% match to contributing employees, the company would contribute $1,500 (3% of $50,000) to John’s SIMPLE IRA, and contribute nothing to Sarah. If the company elects the option to have a 2% match to all employees, the company would contribute $1,000 to John’s accounts AND $1,000 to Sarah’s account. Example: SEP IRA for a Cyclical Business. For a business where income can vary year over year or is very seasonal in nature, a SEP IRA may be preferable. For example, consider a company that sells fertilizer to farmers where a large portion of the company’s sales are likely to occur during only a few months of the growing season. If this company were to have a 401(k) or SIMPLE IRA for their retirement plan, the business would be forced to match employee contributions throughout the year, even when the company is bringing in little to no sales. For this fertilizer sales company, who may be generating very little sales during the winter months for example, this could lead to the company being forced to take on loans to fund employee retirement accounts. This business may benefit greatly from a SEP IRA, where the business would not be forced to use cash matching employee contributions during the lean months or years, and can instead elect one large contribution at the end of the year based on the year’s profits. 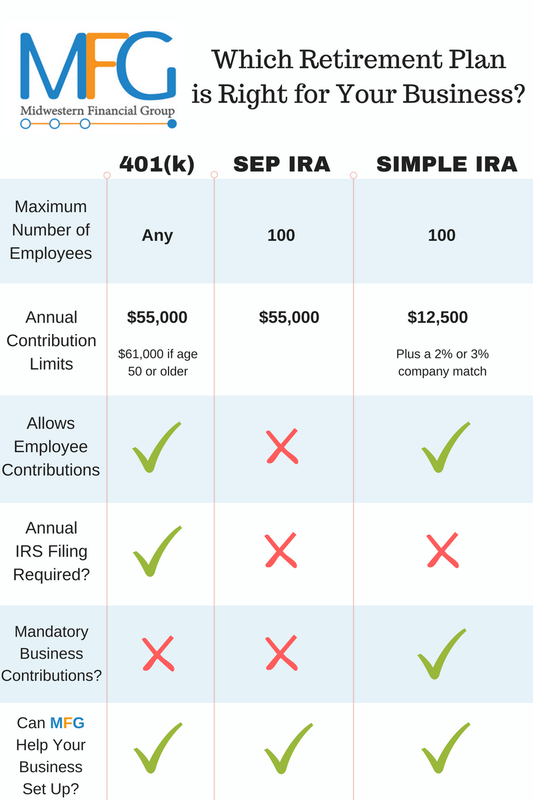 Example: SEP IRA vs 401(k) - Non-highly compensated employees will find it easier to save more in a 401(k) than a SEP.
For a small company (such as a family owned and operated business) with a goal of maximizing retirement savings for its employees, a 401(k) will likely allow for higher retirement contributions compared to a SEP.
For example, company XYZ, Inc. is looking to maximize retirement savings for its three employees, each of whom are paid $100,000 per year. If the company utilizes a SEP IRA retirement plan, employer contributions are capped at 25% of employee compensation. The company can only contribute $25,000 (25% of $100,000) to their employee’s retirement accounts. If the company utilized a 401(k), total contributions to employee retirement accounts can be higher. This is because a 401(k) allows for employer contributions AND employee contributions. With a 401(k), the business is still capped at a contribution equal to 25% of an employee’s compensation, but the employee can also contribute up to $18,500. In this scenario, the employee would be able to save a maximum of $43,500 in their retirement account ($25,000 employer match + $18,500 personal contribution). Also note that 401(k)s allow for catch up contributions, make it possible for an employee over the age of 50 to save an additional $6,000 per year compared to a SEP IRA. Whether your business has one employee or a thousand, we can help you find and set up the right retirement plan for your business. Figuring out the best retirement plan for your business can mean maximizing your tax-advantaged savings, minimizing your business' taxes, and retaining your best employees. Don't make the decision lightly, or on your own without the personalized help and analysis we provide at Midwestern Financial. Better still, the IRS currently provides up to $1500 in tax credits to help offset the costs in setting up a business retirement plan. So contact us today to get started!